Biosecurity Toolkit for Equine Events. The Equine Herpes Virus-1 outbreak, associated with the Western National Cutting Horse Event in Ogden, UT in May 2011, increased awareness and need for biosecurity measures at equine events. 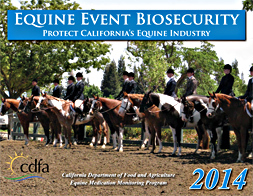 During the outbreak, the California Department of Food and Agriculture, Animal Health Branch (CDFA AHB), received numerous inquiries and requests for guidance for keeping horses healthy at equine events from the equine industry stakeholders in the state. The California Equine Medication Monitoring Program (EMMP) Advisory Committee represents a broad range of equine disciplines regulated by the program and is responsible for addressing concerns of the equine industry. With more than 1600 shows a year that register with the program, the need for biosecurity outreach was evident. Based on limited available biosecurity resources, the CDFA AHB received a formal request for development of a toolkit for equine events from the California EMMP Advisory Committee. Biosecurity is a set of preventive measures designed to reduce the risks for introduction and transmission of an infectious disease agent. Infectious disease pathogens may be brought to and spread at an event premises by horses, people, domestic animals other than horses, vehicles, equipment, insects, ticks, birds, wildlife including rodents, feed, waste and water. Implementation of an equine event biosecurity plan will minimize or prevent the movement of diseases and pests on and off the event premises. Development and implementation of an equine event biosecurity plan is an essential responsibility of the equine event manager that is critical to protecting the equine industry. The objective of this biosecurity toolkit is to provide equine event managers with resources to recognize potential disease risks at the event venue and develop a biosecurity and infectious disease control plan to protect the health of the competition/exhibition horses and the equine population. Each event and venue is unique; therefore, the toolkit provides guidance for the assessment and development of event-specific plans that address the specific identified disease risks of the event and venue. Warning: This is a large document (12MB). We recommend opening individual sections of the document. To provide the equine industry with resources and tools to assess venues and develop event-specific biosecurity and disease control plans for keeping horses healthy at equine events.